Boil water in a large pot. Heat oil in a large pan over medium heat, and saute garlic until it sizzles. Add red pepper flakes to taste; cook 1 minute. Add wine and clams (in shell or from can, after rinsing); cover. Increase heat to med-high; cook 5 minutes. Now it's time to boil the linguine! Cook until al dente. Uncover saute pan; simmer 1 minute more. Add tomato sauce. Season with salt and pepper. Add shrimp,scallops,and mussels (if using). Cook, stirring, until clams and mussels open, about 3 minutes. Toss with linguine. Add parsley; toss. 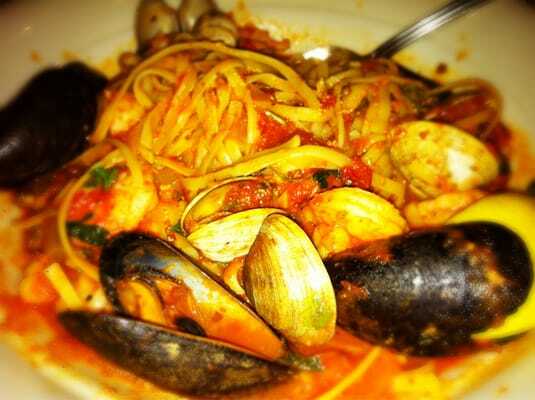 Maggiano's Linguini di Mare also has lobster or at least a lobster flavored broth. I don't recall that it has scallops, but it sounds good anyway. Use crushed San Marzano tomatoes instead of just any old tomato sauce.